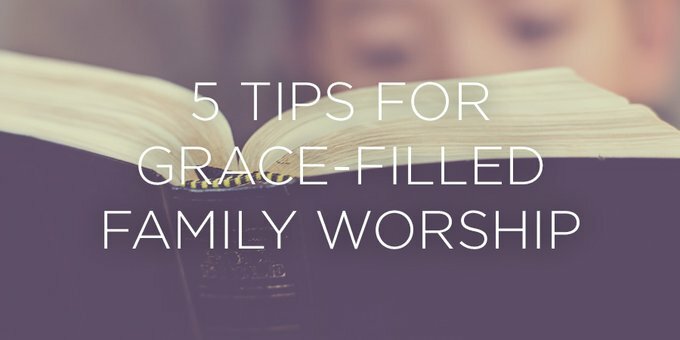 One area of my family's daily routine where we've known seasons of great grace, as well as times of failure, is family worship. Perhaps your family has tasted those sweet seasons where, as you gather around the dinner table, the Bible is already there—as much a part of the meal as the food itself. But maybe you've also known something different: life gets busy, meals are rushed, the schedule is full, and a single day without family worship somehow turns into a string of days. Grace allows our efforts to be spiritual and enduring rather than physical and fleeting. As parents who love Christ and pray our children will one day love Him too, we affirm the value of daily family worship—of daily spending time as a family reading God's word, talking about the gospel, and praying together. But even though we realize the importance, inconsistency is still common. I grew up in a family that gathered every day, with few exceptions, and my parents read God's Word to us, taught us about Jesus, we sang psalms, and we prayed. Almost two years ago, I talked with my Mom about why people fail in this and what practical advice she could offer. The following are five simple and practical ideas that flowed from our conversation back then and that have helped our family grow in the consistency we desire. Pick a time, a place, and a format that works for your family. For different families, different times of the day, different rooms in the home, and different methods and formats may work better or worse. Choose a time, place, and format that works for your family in the season of life you're in, and then stick to it. Be prepared for this time. Have a routine and a structure. The plan might be simple and, particularly when children are very young, the minutes spent together in daily family worship might be relatively short. But whether long or short, plan ahead and then, by God's grace, resolve to stick to that plan. This should be a time of the day that children and parents look forward to and enjoy. There should be laughter and joy. This should not simply be a time when parents talk and children listen, but rather when children are encouraged to ask questions, answer questions, pick songs, and pray aloud. If there are days, weeks, or even months when you fail, don't give up! Know the value, press on, and cling to God's grace. Perhaps even as you read this, your heart is sinking because you're failing to do something you desire. Do you feel that familiar and unpleasant ache of falling short of the mark? I think we often translate that feeling—that ache—all wrong. Sometimes we feel the ache of our failure, and, missing His grace entirely, we make a guilt-laden internal resolve to do better and try harder. The problem, though, is that when we resolve in our own strength to change family patterns or to do better, it's likely that lasting change will remain elusive. So before guilt takes hold and you muster the resolve to do better, allow your mind and heart to linger on the amazing grace you've received in Christ. Grace doesn't grow stagnant. Grace is always fresh. Grace covers perfectly and beautifully when we've failed. Grace brings conviction and the desire to change, to grow, to create new family patterns. Grace allows our efforts to be spiritual and enduring rather than physical and fleeting. If you've failed at daily family worship in the past but long to grow in greater faithfulness and consistency, don't just hastily resolve to do better. Instead, meditate upon God's abundant and transforming grace, praying for His grace to cover, to bring hopeful conviction, and to empower your efforts. What grace, that God accepts us despite our failures. What grace, that the burden of our children's salvation rests not upon us but that it's only the arm of God with the power to save. What grace, that if we've failed at daily family worship in the past, God's mercies are new each morning and we can prayerfully, humbly ask Him to help. We know that our kids are worth it. We know that Christ is the bread of life. We know that men and women and children do not live by bread alone, but by every word that comes from the mouth of God. Knowing all this, let us press on. What practical tips would you add to the list I offered? Elisha lives in Toronto, Canada, a city she loves and longs to see won for Christ. Her husband, Justin, shares her heart for their city and is thankful that God brought him to be the pastor of West Toronto Baptist Church. Though Elisha spends most of her time mothering her three wonderful and funny little ones, she is a lover of the arts and teaches ballet part-time. Is It Time to Re-Think Your Family's Sports Schedule?